Key West has a misnomer about it that it’s an adult-only place to visit. This is totally untrue! We’ve visited several times with our family and have had a great time on each visit. Here are a few family-friendly things to do in Key West. Photo courtesy of Key West Shipwreck Museum. The Shipwreck Treasure Museum is full of artifacts found all around the coast of Key West as it was a very hotspot for shipwrecks. The water gets very shallow very quickly out in the ocean and many ships have run aground there. You can find all the spoils through the museum as well as go on a treasure hunt of your own by finding the hidden anchors throughout the museum. The neat thing about this museum is that when you make it down to the basement level, you are actually below sea level. Hopefully they sealed up the foundation good enough! After heading upstairs, you can get on the roof and climb up to an observatory tower where you can overlook downtown Key West and Mallory Square. A fun way to see the entire island while learning a thing or two is aboard the Conch Train Tour. This is a hop-on hop-off type of train that goes all over the island with several stops. You buy your ticket, jump on the train and can ride as long as you’d like. The driver offers some great history on the island while keeping it funny and entertaining. Our driver did an uncanny impression of Joe Pesci. You talkin to me?! This tour works out really well if you need to get out of the sun for a bit and enjoy a nice breeze aboard the open train. We loved hearing the history of the small island and all the little quirks about it. Can you say haunted?? Of all the things that shows the character of Key West, the Mallory Square Sunset Celebration may take the cake. Every day at sunset, several street performers, food stands, and other knick-knack vendors set up in Mallory Square. The street performers do everything from juggling to sword swallowing to magic tricks. They all do a fantastic job and the humor is great. There’s a few comments intended for mature audiences, but it went right over our kids’ heads. Make it a point to check out the Sunset Celebration when you are in Key West, it is a great time! Every street in Key West has a restaurant or bar. Most of them offer sea food that was caught just a few hours before it is served on your plate. Talk about fresh! They also have any kind of drink you could ask for. Hey, you’re on vacation, right?! Take part in local culture and be sure to get a Cuban Coffee. Your coffee taste will be ruined after having one of these! Delicious! When visiting Key West, there are so many things to do it’s hard to choose. Hopefully this will give you an idea on where to start. Just remember to relax and enjoy that island vibe! Read about more of Florida’s gorgeous beaches here, or take notes on an incredible Florida road trip! 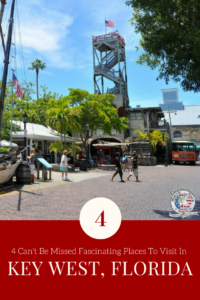 Be the first to comment on "4 Can’t Be Missed Fascinating Places To Visit In Key West"